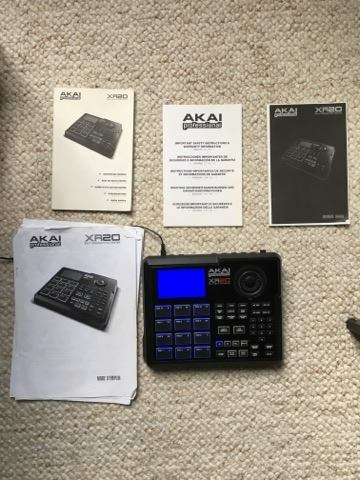 XR20, Drum Machine from Akai. 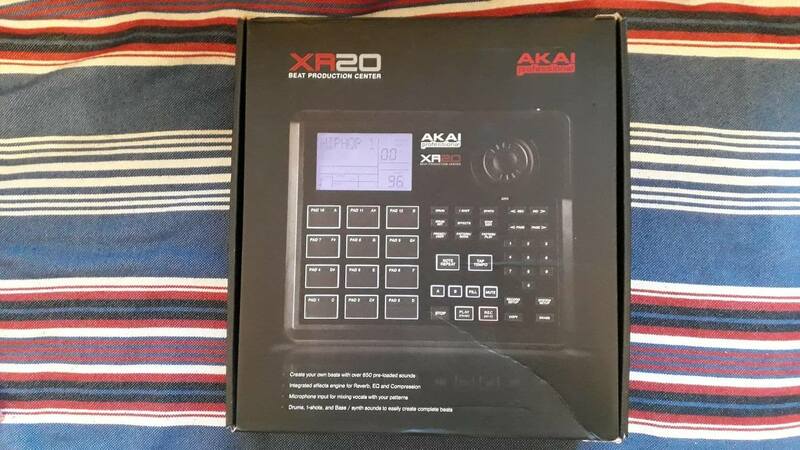 yoTrakkz's review"Decent, not the best from akai though"
The quality on the Akai XR20 seems to be pretty sturdy. The drum pads are fairly stiff, but I was used to their feel within an hour of playing. The LCD is large and important info is easily seen from a decent distance away. There are two footswitch inputs on the back (on/off and A/B/fill), which are a huge plus for me. Outputs are limited to L/R/Aux, but that should be enough for me. My only physical concern was a bit of crackling coming from the headphones when I first tried it out. I soon realized that this wasn't crackling - it was a sample of a record popping 'n' clicking! It would be nice to have USB or expandable memory available, too, but that's easily worked around via midi. I'd also like to be able to switch the swing function on and off as I play, but I can work around this, too. sounds great, doesnt have the feel of the mpc by akai though. Programming is a breeze; you get three separate tracks for your drums, synth (bass or other sound) and percussion or SFX. Up to 32 notes are possible at a time, so you can make quite thick patterns. I've read some complaints about timing or voice-stealing when you load your patterns up to the max, but I don't usually have that much going on at once, so I've yet to notice it. I did try an experiment and maxed out the polyphony, but I didn't notice any drag at all. Pattern or song programming really aren't that different from any other drum machine out there these days; the large pads simply make playing the parts live much easier. You can only save 100 patterns onboard. This should be a concern, but each pattern is really four patterns in one: A, B, and two fills for each of those. Switching back and forth between them - or using their respective fills to lead into the other - is simple and offers plenty of both options and variety for my tastes and needs. - Standard audio and Midi connections (Midi out/thru). - Two effects: reverb and compressor/EQ with presets. - 3-track sequencer: drums, hits and synth. - Well conceived configuration. The blue pad light is essential and quite relaxing. - After only 30 min. of use you can already start to play your first beats... Easier than a Boss. - Modern drum sounds with very heavy kick drums (which sound very good with the integrated compressor). It's very easy to change the sound of the pads. - Nice quantize function. I didn't know that this small drum was made by Alesis. The quantize function is much more effective than the one in Cubase or Fruity. It sounds great. - The effects do their job. - I really miss an additional sequencer track. - Good synth sound especially for bass parts. - The battery operation is a convenient feature. I don't use Fruity or Cubase to create my drum tracks anymore because their quantize function doesn't groove. This one is on the same level as a Boss drum machine. - I've been using it for one week. - I had a Boss Groove five years ago. It had a fantastic groove function but the audio output was not good enough. - Good value for money... I will buy a Roland Fantom G6 or an Alesis as soon as I have enough money because I'm fed up with this cable chaos. Perhaps also a MPC500 because of its groove. I use Fruity only for VST plug-ins. This drum machine has a few different connections. There are standard 1/4&quot; analog outputs if you want to send your beat out to be recorded. You can also output MIDI data of your beats if you want to get them on a workstation. There is a headphone output so you can work on your stuff when you're traveling without the need for speakers or anything. There is also a mic input so you can record something to mix into your beats. There is a ton of flexibility for the sounds you can get. It comes with all different styles of kits. You can also add effects like EQ, reverb, compression and delays. 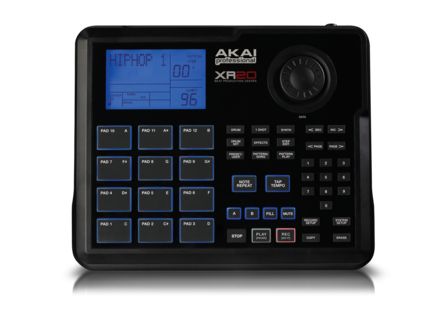 This is really a feature packed drum machine in a small package. On the surface this is very easy to use, and if you just want to make simple beats it's not hard to get going with it and it's self explanatory. You will definitely want to peruse the manual on this thing though - there is kind of a confusing amount of settings you can go through for every sample and every beat you make. Other than adding the effects I mentioned you can't really edit the samples that much, but they give you a ton of them so it's not hard to find something you like. The sounds on this thing are great. I prefer them to a lot of sample packs that I have on my DAW and I end up exporting a lot of sounds from the XR 20 into my DAW sequencer for studio use. It definitely specializes in hip hop type sounds - if you want just a plain realistic sounding acoustic drum kit this is probably not the piece of gear you want. The effects are fair - they do what they say but don't sound as good as a lot of the plug ins you would have on your DAW. The expressiveness of the pads is only about fair as well - the velocity curve on them is kind of tricky and takes a little bit of getting used to. I would probably stay away from the reverbs on the XR 20 and leave that to a different program. I have been using this for over a year now. I love the great choices of drum sounds and the sheer amount they give you to work with. It's also easy to set up songs and sequence part changes and fills which is nice. 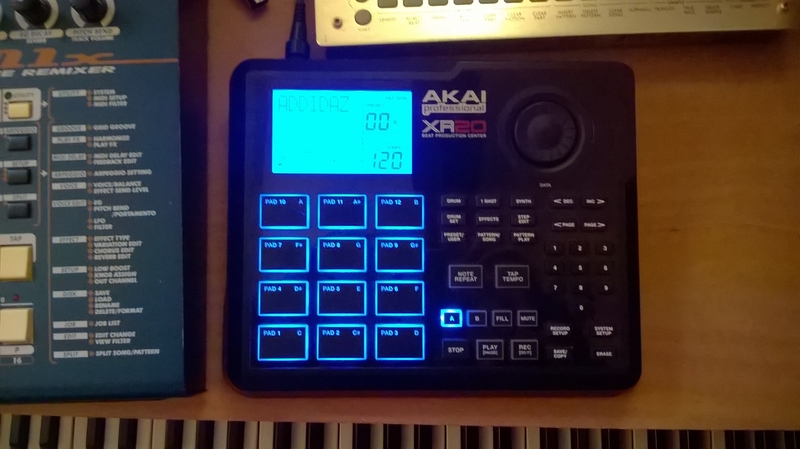 The XR 20 also lets you do some melodic stuff - the drum pads also have note values so you can program in simple synth melodies or basses as well. 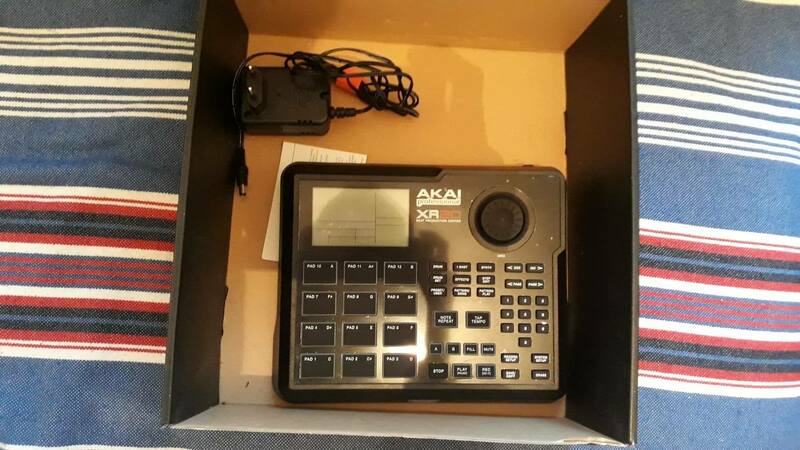 I have tried a lot of drum machines, and this one has great bang for buck. I would get it again. KromeMusic's review (This content has been automatically translated from French)" Well to start but only"
Good little drum machine to start. It is oriented hip hop but also get by electro. It has a drums section 1 SHOT (various samples) and with synth bass leads, violins, pianos ... The sounds are editable there are several effects and parameters (pan, reverb, velocity ...) It has MIDI connection but no usb. Very easy to use, very intuitive. The manual is more than enough. The sounds are really more oriented hip hop. Although she is doing in electro remains insufficient. When used alone, but it goes in a composite with other instruments, it seems flat, we do not hear the sounds do not have enough punch. There velocity but very low. No aftertouch. I use it for more than a year. This is my first drum machine. and my first electronic instrument. At first I was happy but now it gathers dust while I spring from time to time ... Against by the value for money is exellent. Today I no longer used in any component, it is only an instrument for beginners. I do not have that choice. I use my kits drums synth which are a thousand times better. if I had to buy a drum machine would be the spark to arturia or Akai MPC Renaissance. 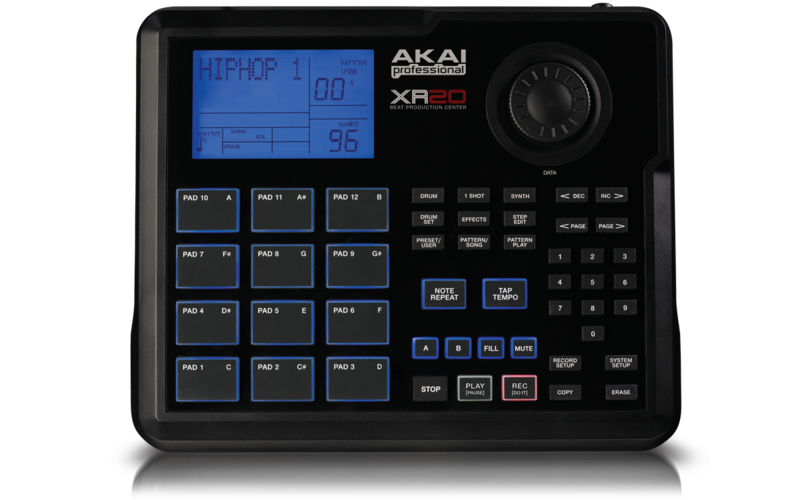 Akai unveils their new drum machine : XR20.